As Director of Upper School, Becky Smith works with the senior leadership team in the ongoing design and implementation of Thaden School’s educational programs and in the recruitment and management of its growing and diverse faculty. She comes to Thaden School with nearly 20 years of experience in independent school education. Ms. Smith earned her bachelor’s degree in psychology from Brown University and a master’s degree in education and adolescent development from the University of Maryland. Most recently, Ms. Smith served as STEM coordinator and science department chair at Harpeth Hall in Nashville. In that role, she helped Harpeth Hall earn national recognition for its integrated STEM program. 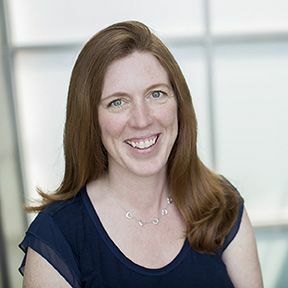 She has also been a leader in addressing the gender gap in STEM professions, both as the director of a summer engineering institute for high school girls in Nashville and as a member of the consortium board for the Center for STEM Education for Girls. An award-winning teacher, Ms. Smith started her career at St. Stephen’s & St. Agnes School in Virginia, where she created and directed a summer program for students new to independent school education. Becky has a quirky love for logistics, recycling, the electric grid, and asking questions such as “What if?” and “How might?” Her bookshelf is the best window into her mind and she enjoys exploring nature with her husband, Perry, and their two daughters.